Parents are one of the biggest influences on children and can play a significant role in how they treat others. Our children watch what we do, and follow in our footsteps. They depend on us to show them how to be caring and help others, and no matter how old your child is, now is the perfect time to start teaching them how to be kind. Doing acts of kindness will not only show our kids how to be kind to others but also how to help others. By doing these small and simple acts of kindness with your kids, you will not only teach them about compassion but also how easy it is to be kind to others. 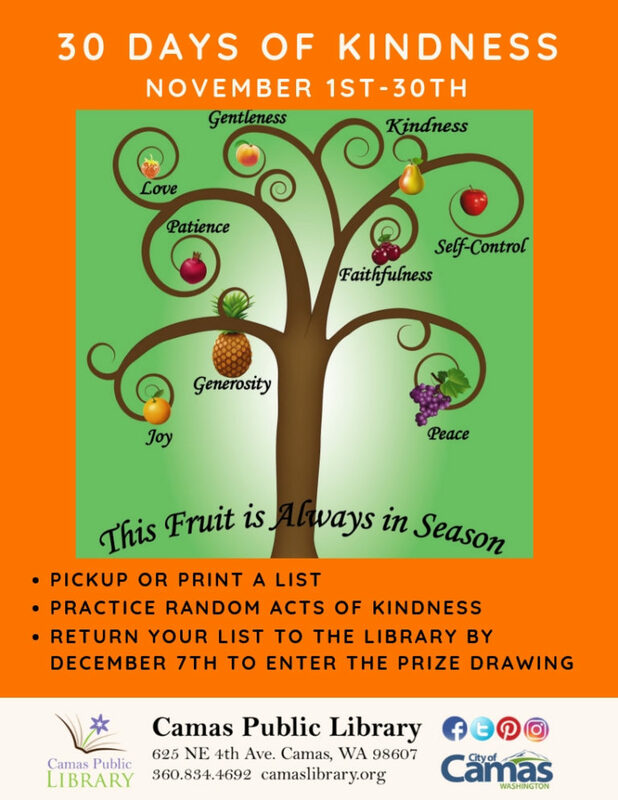 How it works: pick up or print a list, practice random acts of kindness, and return your list to the Camas Public Library by Dec. 7 to enter the prize drawing.